Paddling opportunities abound! This area is blessed with a dramatic shoreline dotted with islands as well as some beautiful lakes and ponds. Look for the boat access icons on the map. Launch your boat into the larger water bodies of Donnell Pond or Tunk Lake, or explore the smaller Little Tunk Pond, Jones Pond, and Flanders Pond. There are primitive, public campsites on the shores of Donnell Pond and Tunk Lake. There are numerous places to park and paddle in the bays and open ocean. Please be extra cautious when kayaking or canoeing in the ocean! Stay very close to shore and go in fair weather if you are not fully prepared to manage the significant tides, currents, rain, fog, wind and waves. Land and islands that are open to public use are shown in green. 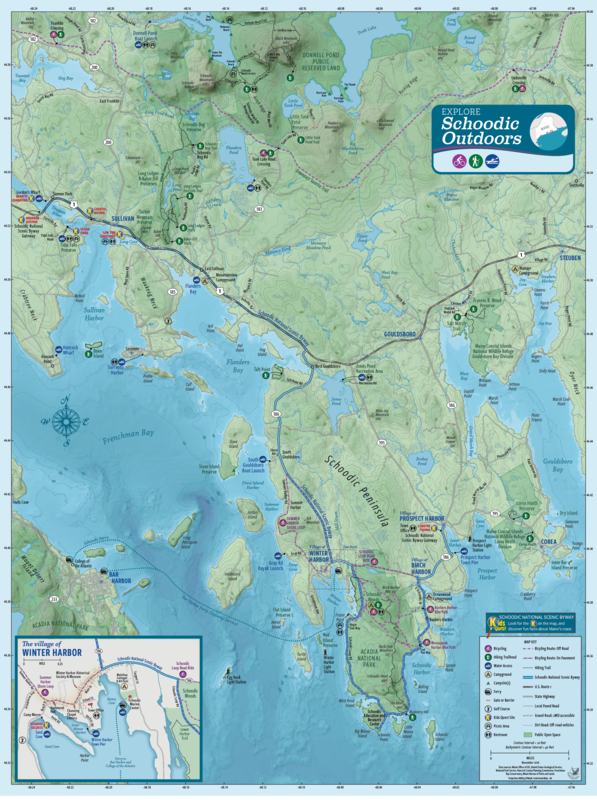 Schoodic Island and Rolling Island off Schoodic Point, located in Acadia National Park, are closed from February 15 through August 31 to protect nesting birds. Maine Coast Heritage Trust’s preserves on Ned, Flat, and Stave Islands are great for picnicking, swimming and exploring. A campsite on the southeast end of Stave Island is open for use. Call MCHT at 207-729-7366. WARNING! Changing tides, high winds, swift tidal currents and large waves create unpredictable and challenging conditions making ocean kayaking very dangerous. The unpredictable nature of these hazards, combined with Maine’s cold waters, can lead to hypothermia and death if you are not prepared to deal with an overturned boat. Make sure you have the proper equipment and experience for coastal Maine kayaking. Visit the Maine Association of Sea Kayak Guides website for more information about safety and equipment or to find local guides. For local tide charts click here. No matter where you paddle—always wear your life jacket!